RhiReading: Kindle Me (3) : Help me get these put out on Kindle! Kindle Me (3) : Help me get these put out on Kindle! Happy Saturday dear readers! I try to sit down a few times a year and go through my Amazon wishlist making sure I've cleared out any titles I picked up elsewhere and checking the ones that aren't on Kindle yet to see if they're now available. The cool thing is that YOUR clicks from my last two Kindle Me posts have helped! So I'm going to make this a regular quarterly feature here on RhiReading. Here's how it works... I post links to books that I have on my wishlist that aren't available on Kindle yet. If you're feeling helpful or plan on buying these (whether in this format or another) click on over and use the button to Tell the Publisher! Then you can share links to books you'd like myself or other readers here to do the same for. On the book's page just seek out this section right below the cover and click it, it's that easy. 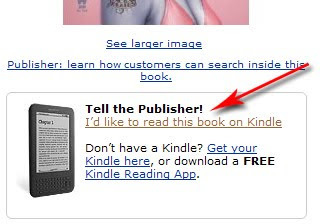 By clicking the link you're encouraging publishers to make sure this format is available for those of us who have chosen to start reading in an ebook format. Sure, not everyone likes ebooks (I wasn't one who liked the idea until I got an ereader and discovered the advantages for the environment and more) but does it really matter which format we prefer as long as we're all still supporting reading? Most of the time books that are new or out for pre-order but do not feature a Kindle format yet will do so within a few weeks of or on the release date. But often times older books, especially those who have gone out of print and aren't available new, need reader interest shown. My list mostly consists of those. I've been reading your posts, but not responding. I'm having to catch up on posting my reviews and reading. ^^; Been a mixture of laziness and too busy.